Status report is mainly for getting valuable insights into the team on a regular basis. Right? It's for getting the knowledge of how things are humming around at the office. There are different templates that help managers in the reporting process. We have provided status report template for teams that hesitate experimenting with automatic online software. Need more valuable data inside your #team? Try this #free status #report #template. But one, perhaps most surprising, side-effect or added value of using status report software is it's ability to improve team meetings. Do you know these annoying, time-wasting team meetings? 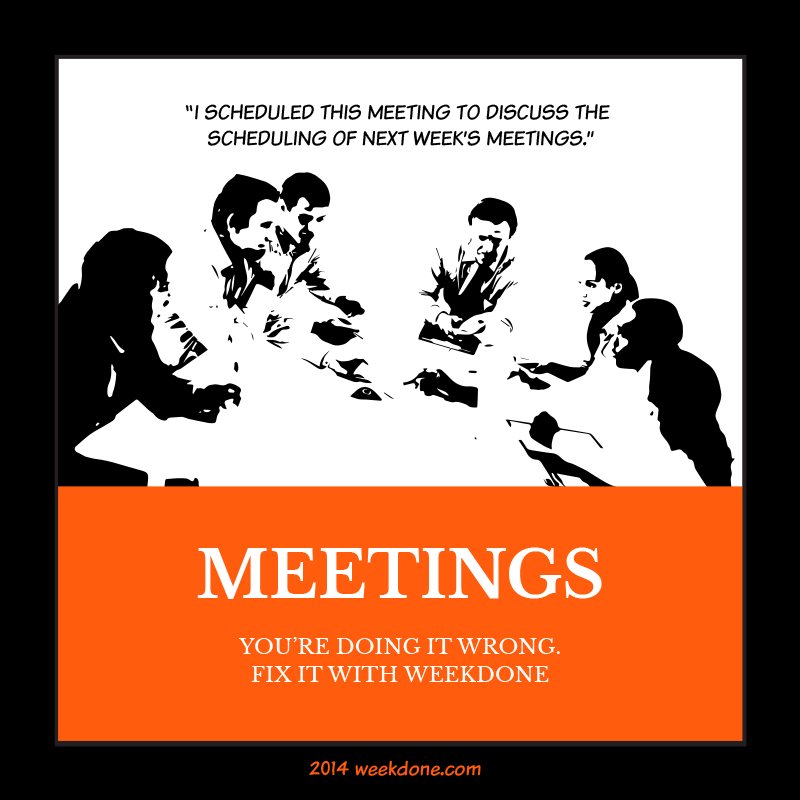 I can bet you have held at least few of these kind of unproductive meetings. What you might not know, is the true reaction these team meetings bring up among your employees. Unfortunately, we don't know either and that's not even our goal to find out. What we are certain about is that efficient team meetings will please anyone. Why I sound so confident? We have tried teamwork without meetings. An experiment that lasted for a week, but taught us a thing or two about time management. We have also seen our clients improve their meetings by using weekly progress report. Do you feel unproductive team meetings are even a problem? For a moment, let's discard the quote by Scottish writer and philosopher Thomas Carlyle that “Statistics are the greatest liars of them all” and concentrate on the data. We are trying to prove a point here, so we need facts to support our gut feeling. That being said, we made a little research. According to a Microsoft Office Survey employees average only 3 productive days per week. What is more, people across the globe spend 5.6 hours each week in meetings and 69% feel meetings aren't productive. In the U.S. meetings are increasingly virtual, but still take a rather aggressive and confrontational approach. Nevertheless, office workers spend an average of 4 hours per week in meetings. They feel more than half of that time is wasted. Therefore, employees in the U.S. waste average 2.5 hours a week that costs businesses 37 billion dollars a year. In U.S. office #workers waste 2.5 hours a week & $37 billion a year on #unproductive #meetings. In the UK meetings are very frequent and viewed as open debate of an issue. They often are inconclusive with relatively little preparation done beforehand. UK office workers waste 2 hours and 39 minutes in meetings every week, and it's costing businesses an estimated 26 billion pounds a year. In UK #workers waste 2 hrs 39 min a week & £26 billions a year on #unproductive #meetings. How to avoid being another victim in the statistics pool? If there is something even more important, don't hesitate to jump in. How status report can save old-fashioned team meetings? If you are like any other busy team leader, you probably don't have enough time to prepare agenda for every weekly team meeting. Although this is a tremendous mistake, there are remedies. Status reports provide an automatic meeting agenda. How? Each week, after the reporting deadline, you get an automatically compiled pdf report right to your inbox. This valuable piece of document includes all the achievements, plans and problems of your team. With a glance you know which issues should be discussed and who to praise. As status report reflects each team member's contribution, you can decide to either take the decision-maker role by yourself or assign it to the person who is responsible for the task under observation. Which ever way you choose, communicate the decision at the beginning of the meeting. By making status reports visible to the team prior the meeting, everyone are in the loop. There are less surprises and the team can start the meeting from a mutual ground. The natural curiosity that is hidden inside each and every employee is exactly what makes them read through the report. There is nothing more satisfying than to see that you outperformed someone else or found a new clever way to approach a problem. Having a clear overview of people's activities and their outcomes during the week gives a valuable opportunity to focus on more strategic issues. Status reports indicate the challenges your team is facing and therefore help you focus the discussions on more pressing issues. If you're truly committed to improving your team meetings, use also the fun interactive Team Meeting Checklist. to improve productivity and remind everyone about the upcoming meeting. Before the meeting, go over the checklist, reminding of what makes a productive meeting. Send the meeting checklist to other participants together with the event invite. 1. Whenever facts are presented, draw a Venn diagram. 2. Loudly, translate % into fractions. 3. Every now and then, encourage people to "take a step back". 4. While others are speaking, nod continuously and pretend to take notes. 5. After the guy from engineering department has spoken, repeat the last thing he said, but very slowly. 6. If you're out of questions, just ask "will this scale?". 7. When the sleep kicks in, pace around the room. 8. During a presentation, ask the speaker to go back a slide. 9. Make yourself important by stepping out to take a fake phone call. 10. Last but not least, don't forget to make fun of yourself. There are thousands of articles with great tips that might help improve your staff meetings. No doubt, these tricks might work as well, but they demand continuous attention and experimentation. Our idea is easy and it's already automated in a way, that doesn't demand extra time. Whether you decide to give our status report software a try or start off with our free status report template, doesn't matter. What truly matters for us, is that we would stop wasting our precious time on unproductive meetings and challenge ourselves and our teams to seize the day. Now, the ball is in your court. Imagine having extra three hours a week, where would you invest that time? Tell us the first thing that pops in mind. Remember to follow us on Twitter, Google+ and Facebook for all about time management, status reporting, status report and more!